Ingredients: chicken meal, rice, corn, chicken fat, fish meal, barley, hydrolysed chicken liver, beet pulp, yeast, egg powder, fish oil, minerals & vitamins, chondroitine, glucosamine, lecithin (min. 0,5 %), inuline (min. 0,5 % FOS), taurine, choline chloride. Analysis: protein 32,0 %, fat 18,0 %, fibre 2,0 %, ash 6,0 %, moisture 8,0 %, phosphor 0,9 %, calcium 1,4 %. Added: vitamin-A (E672) 20000 IU/kg, vitamin-D3 (E671) 2000 IU/kg, vitamin-E (as all-rac alpha tocopheryl acetate) 400 mg/kg, vitamin-C (as l-ascorbicacid phosphate) 250 mg/kg, taurine 1000 mg/kg, E1 75 mg/kg, E2 1,5 mg/kg, E4 5 mg/kg, E5 30 mg/kg, E6 65 mg/kg. 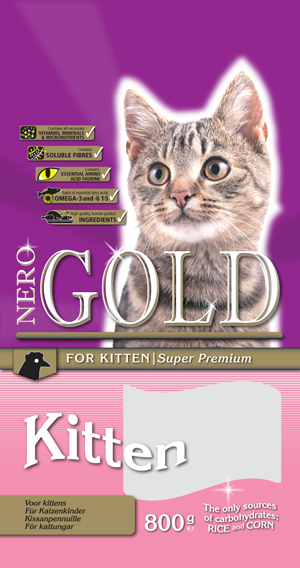 Ingredients: lamb meal, rice, corn, chicken fat, hydrolysed chicken liver, fish meal, cellulose (min. 5 %), beet pulp, yeast, egg powder, minerals & vitamins, chondroitine, glucosamine, fish oil, inuline (min. 0,5 % FOS), lecithin (min. 0,5 %), choline chloride, taurine. Preserved with natural antioxidant. With hairball transit system. 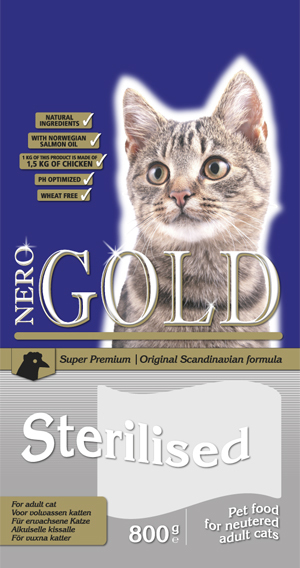 Ingredients: chicken meal, rice, peas, barley, poultry fat, cellulose, corn, hydrolysed chicken liver, salmon oil, flax seed, dried salmon, egg powder, brewer’s yeast, inulin, yucca shidigera extract, cranberries, taurine, L-carnitine. Analysis: protein 36,0 %, fat 12,0 %, fibre 5,0 %, ash 4,3 %, calcium 0,85 %, phosphor 0,73 %. Added: vitamin A 18000 IU/kg, vitamin D3 1800 IU/kg, vitamin E (all-rac alpha-tocopherylacetat) 600 IU/kg, E1 75 mg/kg, E2 1,5 mg/kg, E4 5 mg/kg, E4d7 1500 mg/kg, E5 30 mg/kg, E6 65 mg/kg. Ingredients: Chicken meal, rice, corn, chicken fat, fish meal, barley, hydrolysed chicken liver, maize gluten meal, cellulose (min. 5 %), beet pulp, minerals & vitamins, yeast, egg powder, fish oil, inuline (min. 0,5 % FOS), lecithin (min. 0,5 %), yucca shidigera extract, choline chloride, hydrolysed cartilage (source of chondroitine), hydrolysed crustaceans (source of glucosamine), calcium carbonate, taurine, L-carnitine. Analysis: Protein 28,0 %, fat 20,0 %, fibre 5,0 %, ash 6,0 %, moisture 8,0 %, phosphor 0,8 %, calcium 1,3 %, natrium 0,45 %, magnesium 0,08 %. Added: Vitamin-A (E672) 20000 IU/kg, vitamin-D3 (E671) 2000 IU/kg, vitamin-E (as dl-alpha-tocopherolacetate) 400 mg/kg, vitamin-C (as l-ascorbicacid phosphate) 250 mg/kg, copper (as cupric sulphate, pentahydrate) 2,8 mg/kg, taurine 1000 mg/kg, E1 75 mg/kg, E2 1,5 mg/kg, E3 0,5 mg/kg, E4 5 mg/kg, E5 30 mg/kg, E6 65 mg/kg. Ingredients: chicken meal, rice, chicken fat, fish meal, corn, hydrolysed chicken liver, beet pulp, yeast, egg powder, fish oil, minerals & vitamins, chondroitine, glucosamine, lecithin (min. 0,5 %), inuline (min. 0,5 % FOS), taurine. Analysis: protein 34,0 %, fat 22,0 %, fibre 2,0 %, ash 6,5 %, moisture 8,0 %, phosphor 0,8 %, calcium 1,4 %. Added: Vitamin-A (E672) 20000 IU/kg, vitamin-D3 (E671) 2000 IU/kg, vitamin-E (as all-rac alpha tocopheryl acetate) 400 mg/kg, vitamin-C (as l-ascorbicacid phosphate) 200 mg/kg, taurine 1000 mg/kg, E1 75 mg/kg, E2 1,5 mg/kg, E4 5 mg/kg, E5 30 mg/kg, E6 65 mg/kg. Preserved with natural antioxidants. With hairball transit system.